Smugglers Rock Country House was built in approximately 1840. It was built as a temperance inn for the workers at the Alum Works in the village (more information about this below). The stone to build the house (as well as the windmill and Mill House opposite us) was dug out of the ground at the local quarry. Legend has it that the workers left the quarry one lunchtime and when they returned they found that they had hit a natural spring which had filled the quarry with water, and so the quarry was abandoned to nature. 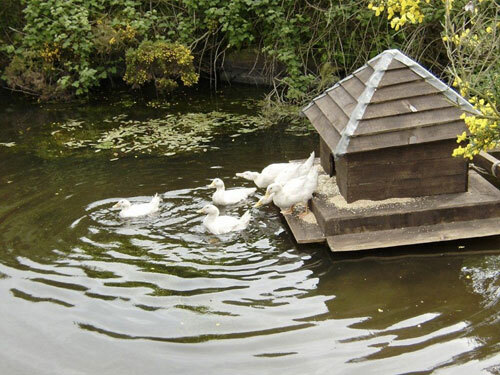 Our wildlife pond at the front of the house is what was the old quarry, and is now home to our ducks and geese. 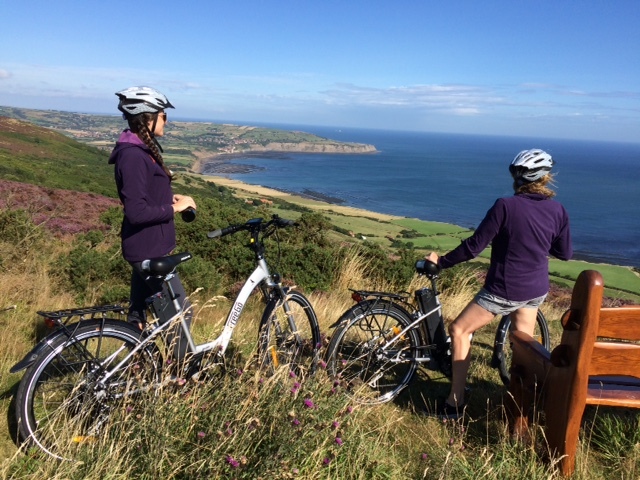 This part of the Yorkshire coast is well known for smuggling and there are many secret passageways, particularly in Robin Hood's Bay, which aided the distribution of the contraband brought in by sea. Smugglers Rock was at this time a coaching inn as it is situated on what used to be the main coaching road between Scarborough and Whitby, and had a clear view in both diretions. In the eastern wall at the front of the house there is a 9"x3" glass window, into which a lighted candle was placed. This was to alert smugglers to the fact that the area was clear of constabulary and that it was safe to bring the contraband up from the beach. There is also allegedly a tunnel from the cellar of Smugglers Rock to the beach (a distance of more than 1/2 mile and a drop of over 600 feet!) - it has not yet been found. Smugglers Rock was originally known as the Ravenhill Inn and closed at around the time the Alum Works closed (apx. 1862). The original bar rooms of the inn are now our breakfast room and guest lounge. The part of the building which was built as the stables for the inn guests' horses has been converted into two self-catering cottages. We also have a picture in our hallway showing the meeting of the Staintondale Hunt in 1891 - Smugglers Rock is the house in the picture and looked very different to how it looks today. In 1913 our house was left in the Will of John Hammond as part of a very large area of land in Ravenscar to the Peak Estate Company in trust to be sold. At this time the house was called Moorfield House. The house changed hands again and became the Blue Robin Inn (reputedly named after the landlady who wore a blue apron!) The house fell into disrepair for a while until it was bought by a new owner and restoration work began. The house name was then changed to Smugglers Rock and the property became a guest house and cafe. The house changed hands again in 1979 and had considerable improvements made and extensions built. We took over the property in November 1999 and are continuing with the extensive programme of renovations and improvements, including adding Smugglers View cottage for the 2003 season. In the last few years, we have installed solar panels to heat 90% of our hot water during the season, and solar PV panels to reduce our Co2 footprint. We have added a new water pump and storage tank for our water (which we pump from a borehole on our land). The water is filtered but has no additives and makes a lovely cup of tea! We have also replaced all of our lightbulbs with low energy bulbs and have an environmental policy in place as well as recycling a large amount of our rubbish. During the winter of 2013/14 we installed a wood pellet burning biomass boiler to replace our oil boiler and provide the heat for Smugglers View cottage and also for the guesthouse. 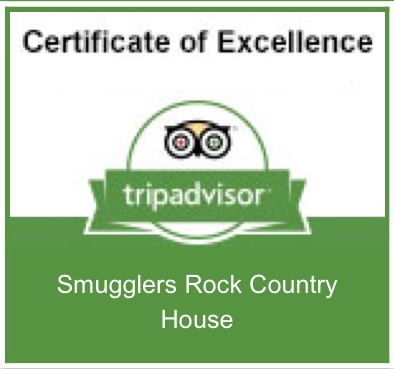 Smugglers Rock is a registered smallholding with approx 30 acres of land. We have a pond at the front of the house which is fed from an underground spring (see above). The pond is now home to our ducks. We have two Shetland ponies Elfie (born May 2001) and Dream (born at Smugglers Rock in May 2003). They sometimes spend time in the paddock behind the caravan site, but are usually to be found in the field at the front of the house. They enjoy company (Elfie in particular, who is very inquisitive) and they are all partial to carrots and polo mints! Our fields in front of and opposite the house usually have Scots blackface sheep in residence and between April and June there are lots of lambs to be seen running about. There are also cattle in the surrounding fields and if you stroll down the lane in front of the house in the spring and summer you can see the calves with their mothers. In October 2009 we purchased three highland cows which we have named Hattie, Heidi and Honey. They settled into one of our fields with their three calves. All three cows had a calf each year since 2010, some of which are still in the field. We have around a dozen free range hens which keep us supplied with eggs. We also have Barney, our chocolate labrador who loves life at Smugglers Rock and will be more than happy to meet any guests who want to be greeted by him! In May 2011 we got Molly, our beagle who was an RSPCA rescue dog, to give Barney some company. For guests who have allergies, please note that we do not allow pets, including our own, into any part of the guesthouse although we do allow them in our self catering cottages.